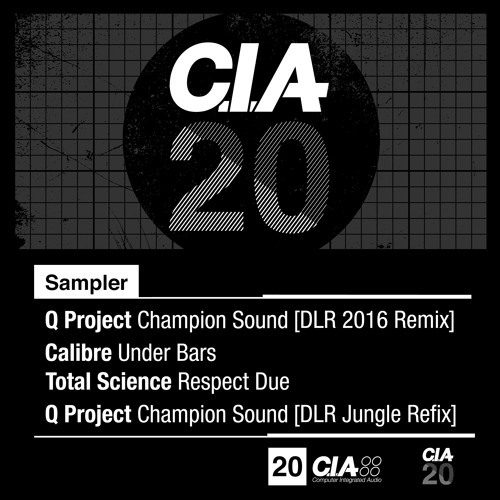 CIA mark 20 years in the game with a massive new LP, and ahead of the main event there’s a cracking sampler just out featuring some top tracks from familiar label names. DLR jumps in on the remix for Q Project’s anthemic Champion Sound, retaining the original’s distinctive synth hook but pairing it with an appropriately hefty selection of beats and bass for the current era of D&B. Sure fire dancefloor weapon! Elsewhere Calibre delivers a characteristically smooth pinao-led roller in the form of Under Bars, and label dons Total Science throw down some fine break choppage on the dub-tinged Respect Due. There’s also a cheeky second remix of Champion Sound with DLR swapping out the beefy modern tech underpinnings of the 2016 remix for something a bit more jungle-y. Tasty stuff! Check out the clips below and hit up the CIA Bandcamp to grab this on vinyl or digital right now.